RC Willey offers this beautiful washed brown 4 piece decorative entertainment center wall unit. This collection features a vintage look with its distressed finish enhanced by vine-like accent hardware. With a generous combination of open and closed storage, you will have ample space to store your media needs and display your favorite possessions. Call the neighbors, you will love to host a movie night in front of this beautiful entertainment center from RC Willey! This entertainment center includes the TV Stand, right & left pier base, right & left pier top and the hutch. This beautiful 84 inch distressed ceruse TV stand is offered by RC Willey. With a combination of open and closed storage, you will have ample space to store your media, gaming, and streaming devices. With the drawers and closed door storage, say goodbye to clutter as you hide away the unsightly pieces of your entertainment collection. Call the neighbors, you will love to host a movie night in front of this beautiful TV stand from RC Willey! 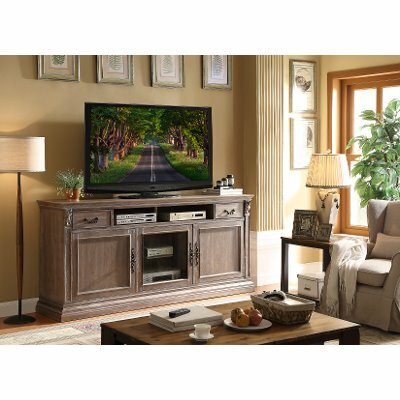 Washed Brown 4 Piece Decorative Entertainment Center - Estancia is rated 5.0 out of 5 by 1. Rated 5 out of 5 by Malou The best huge classy entertainment center!!! Very classy. Looks like custom-made, even better. Accommodates up to 90”TV. Lots of storage. Very stable. Very nice details. Outstanding overall.